Welcome to the March Authentic Parenting Blog Carnival: Discovering Through BooksThis post was written for inclusion in the monthly Authentic Parenting Blog Carnival hosted by The Positive Parenting Connection and Authentic Parenting. This month our participants have investigated what role books have played in their lives. Please read to the end to find a list of links to the other carnival participants. As we've been unschooling Mikko, I've come to appreciate ever more the way books and other resources allow us to follow his interests. As soon as he sparks a conversation — germs, sharks, teeth, mummies — he knows what he wants next from us: something concrete like a book or video to look at, listen to, or read with us. It's fun to try to trace the steps back as to why I checked out so many children's books about the digestive system and see how his own learning journey brought us all to study more about these various topics. I love how he already knows that unschooling doesn't mean eschewing outside expertise or a parent's guidance. On the contrary, Mikko knows immediately that a book, online article, or YouTube video we can source for him will further his understanding and lead him into new topics of interest. Our cat died a year and a half ago, and Mrs. Pim still comes up in conversation. I'll be driving to the swimming pool, and he'll pipe up from the back seat, "I can give Mrs. Pim medicine to make her feel better." Ah. Preschoolers and death. First we went to an online world map. "Here we are." I pointed to the Pacific Northwestern USA. "Here's Egypt." I pointed to northern Africa. "Here's aaaaaaall this land and aaaaaaall this water to cross over to get to Egypt." I explained that mummies can't swim or cross over land — because they're dead. And dead things don't move. That's one of their enduring traits. Next we checked a couple books out of the library — one I recommend for older kids but not as much for littles. Mummy , by James Putnam, was enough to give me nightmares, and it unfortunately did that in fact for Mikko. 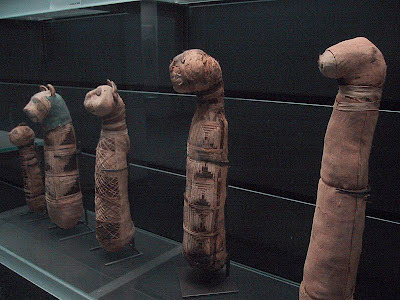 It was all very factual and thorough, with full-color photographs throughout, but here's the thing: Unwrapped mummies are ugly. And we usually don't have much information about how these people (and animals — there was a whole page of cats) met their ends. Mikko and I were both especially troubled by the several instances of child mummies the authors included. Mikko does not like to contemplate his own death. (Neither do I.) I had tried to vet this book beforehand and hide it, but I hadn't hidden it well enough. Such is one of the dangers of allowing your children access to books! The other book we explored was a better fit for a preschooler: Mummies, Pyramids, and Pharaohs: A Book About Ancient Egypt , by Gail Gibbons. It featured drawings instead of photographs, and the drawings were all of old-timey Egyptians, making it all a little more distant. Mikko could pretend that only people who lived a long time ago ever died. (Yes, I've explained that this isn't true, but I'm allowing him the time he needs to come to terms with the cruel realities of existence.) This book talked a lot about why the Egyptians practiced ritual mummification, and how they went about it. King Tut is coming this summer to the Pacific Science Center (yes, belying my insistence that mummies never migrate from Egypt, but I think Mikko will forgive my deception), so we'll definitely have to get tickets and go see. What a perfect field-trippy tie-in! You can't turn your back on this one for a second. 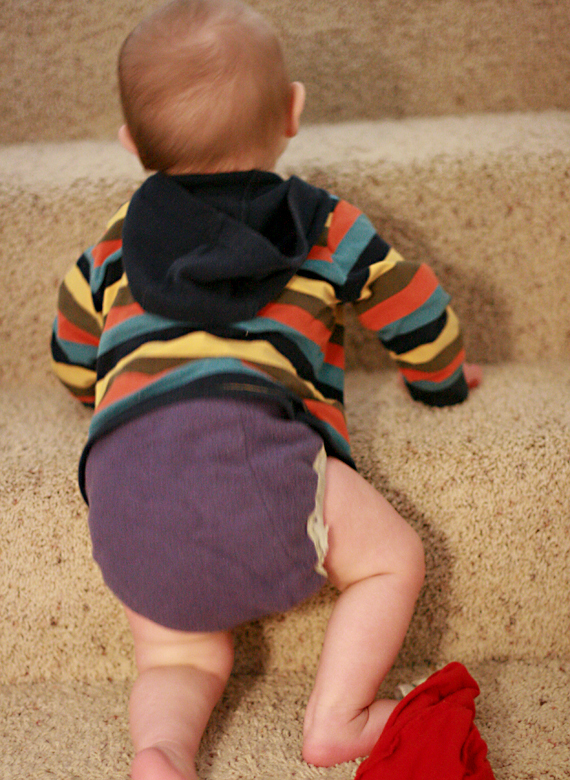 Zoom … up the stairs! Theme: Kids and Personal Care: Is parenting next to cleanliness? Tell us how your kids get clean — for instance, share a recipe for homemade shampoo, give tips on ending bath time struggles, or offer a hairstyling tutorial. Carnival date: Tuesday, April 10. Before you post, we will send you an email with a little blurb in html to paste into your submission that will introduce the carnival. You will publish your post on April 10 and email us the link if you haven't done so already. Once everyone's posts are published on April 10 by noon Eastern time, we will send out a finalized list of all the participants' links to generate lots of link love for your site! We'll include full instructions in the email we send before the posting date. Do-it-yourself guides from the NPN team! It's that time again! You might remember the great post in December 2011 that highlighted the Natural Parents Network volunteers' most popular or favorite posts from the year. Well, we are back, and this time we are bringing you a collection of posts that focus on do-it-yourself projects, how-tos, tutorials, recipes, and step-by-step guides. Natural Parents Network is a community of natural-minded parents and parents-to-be where you will be informed, empowered, and inspired to live your values. I am proud and honored to work with the many volunteers who keep Natural Parents Network running — they're not only valued workers but now also good friends. The volunteers who dedicate their time and energy to making NPN the outstanding resource it is also spend countless hours informing, empowering, and inspiring others on their personal blogs. There are a lot of really wonderful posts here and I hope that this serves as an excellent resource that you can pass on to your friends! We hope you enjoy reading these posts as much as we enjoyed writing them. We are always looking for new volunteers so please, contact us if you are interested. 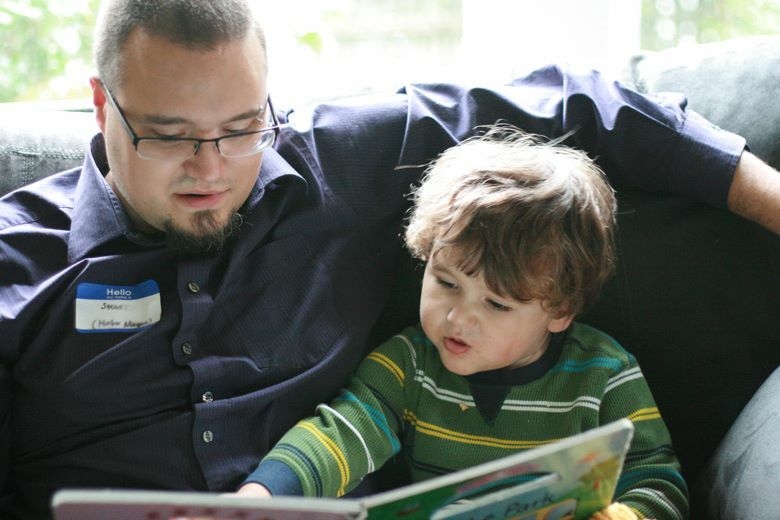 Just a few hours per month can help other parents in a huge way! 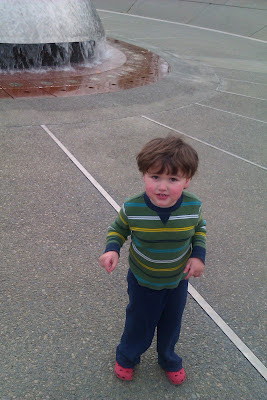 Mikko had this great idea this past week to go downtown to the fountain in Seattle Center. 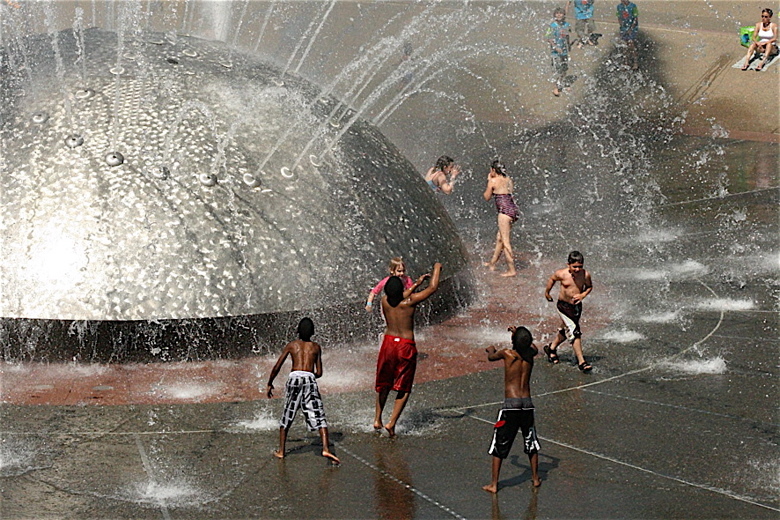 It's a fun fountain that children can run through and get soaked in the summer. Sam and I both told him it wasn't running, because it was winter, but he insisted it was warm enough that it should be. In other words, he needed to see it for himself. I drove both boys downtown while Sam went off to work. I had gotten a late start so I drove instead of taking the bus. 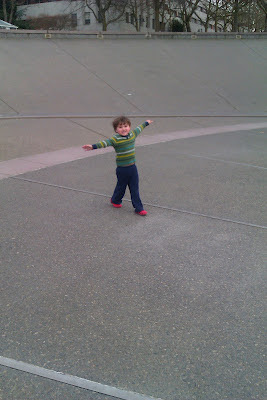 As it was, we were barely going to have an hour at the Pacific Science Center before it closed; that's in the same complex as the fountain and seemed like a good excuse for taking this excursion that I predicted would otherwise prove futile and disappointing. I drove around looking for street parking some distance away, navigating the one-way streets and avoiding all the cars who had a purpose in life beyond seeking out an open parking spot. I found one, finally. I parallel parked. I opened the door to go back to the hatch to pull my wallet out of the diaper bag … and then had a clear vision of that same wallet, at home. Mikko was not thrilled with this change of plans. The change included leaving my hard-won parking spot, battling rush hour freeway traffic to get back home, and all of us being super cranky because now we hadn't eaten in too long. 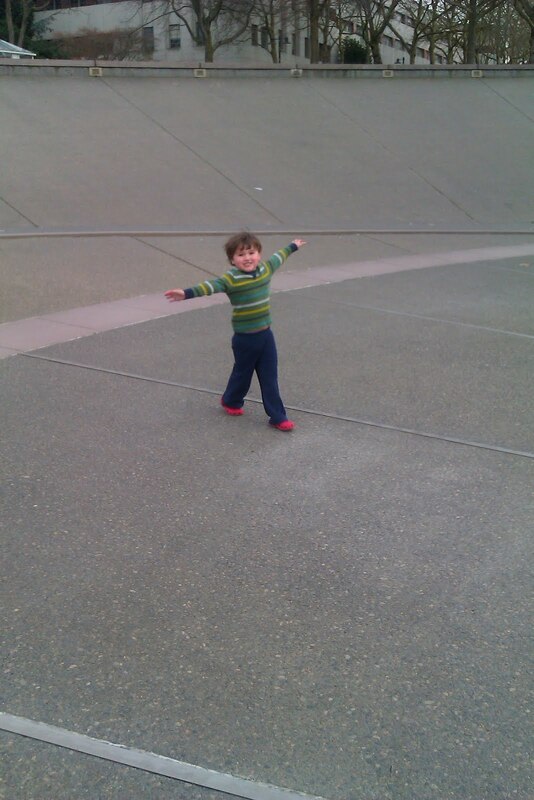 Plus, we hadn't seen the fountain. He kept insisting I could use his tooth fairy money to pay for parking, not understanding that it wasn't a matter of simple transfer of monetary credit but actual lack of any means of payment present. He cheered up when we ended up at a local cafe for dinner instead and one of his buddies walked in with his mom, to sit with us and play hide-and-seek outside afterwards. But the next day! The next day was Fountain Day. We were going to figure out the fountain mystery once and for all. Was it on? Or was it not? I put my wallet in the diaper bag. I made extra sure of that. I drove again (we were late again; we're always late), but we parked in the science center's lot. I knew we'd need several hours total to make this second trip worth it. We got our science on, then ate a quick food-court dinner, and then Mikko led us all into the welcome evening sunlight, toward … the sound of running water. The fountain was on! Not as gloriously and unpredictably as in the summer, but I was fine with that, considering I hadn't brought him a change of clothes. A group of kids showed up with their parents and began to run back and forth, up the inclines and down. Mikko joined in with glee, as if into a surrogate family. Alrik and I chilled (quite literally) on the bench seats and watched the racing and spinning. The fountain. Mikko was right, and I was wrong. He was very happy about this, and so was I. He led us back inside Center House where we could warm up and use the restrooms before our drive back home. I was glad we were getting all the use out of the parking I'd paid for (with the money in my wallet! ), and he was glad to get in some more freebie elevator rides. We went upstairs to where the giant floor chess and checkers games live, and random men sit on chairs nearby with backpacks and winter coats strewn around them. I joined the outskirts of that crowd while my boys played chess. 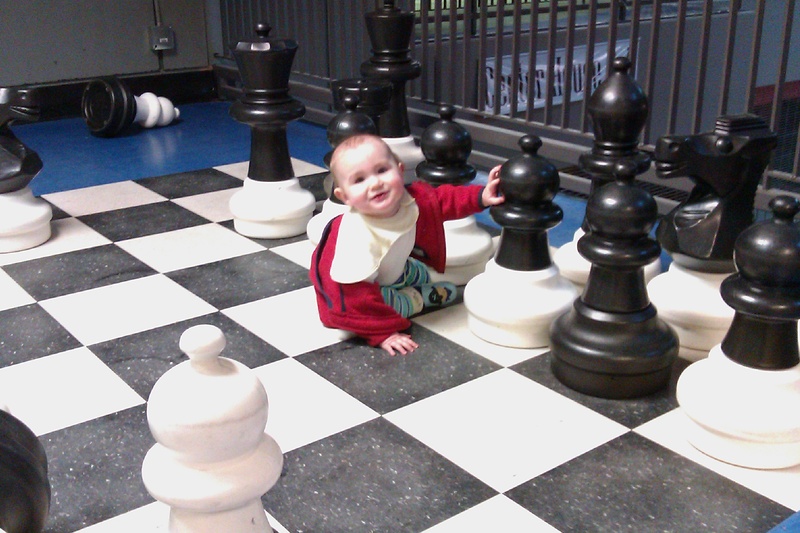 And by "played chess," I mean crawled around on the board and knocked into pieces. I had an epiphany about why I'm so terrible at chess (and actually, terribly uninterested in it). I love logic puzzles and games, but I figured out why chess is different: It has a spatial component, where the pieces move in certain definable ways. I have no spatial intelligence. I can't picture in my mind how the pieces move or remember how they go or predict where they should go. It all makes sense now. For no good reason, it's highly reassuring to finally figure out that it's my low intelligence making chess hard for me. I'm already better than you at chess, Ma! And then we went home, waving farewell to the parking lot monitor, whom I'd previously taken to be a student hanging out at the entrance, wearing an adorable earflap hat and reading a book and smiling at us as we had driven in. She was still there, but now wandering around making notes about the cars. I felt good about this somehow, that she had a job checking that we were parking correctly, because whenever I pay in an unsupervised lot, I wonder if I'm a sucker. All in all, a good day. 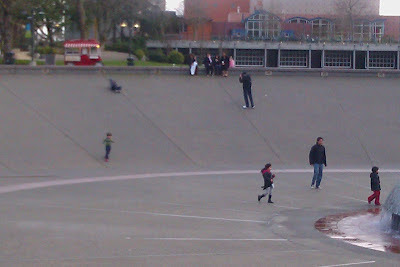 Science, fountain dancing, revelations about chess, and reassurance about the parking lot system. And if you've read this far, you might as well keep going. Some links! 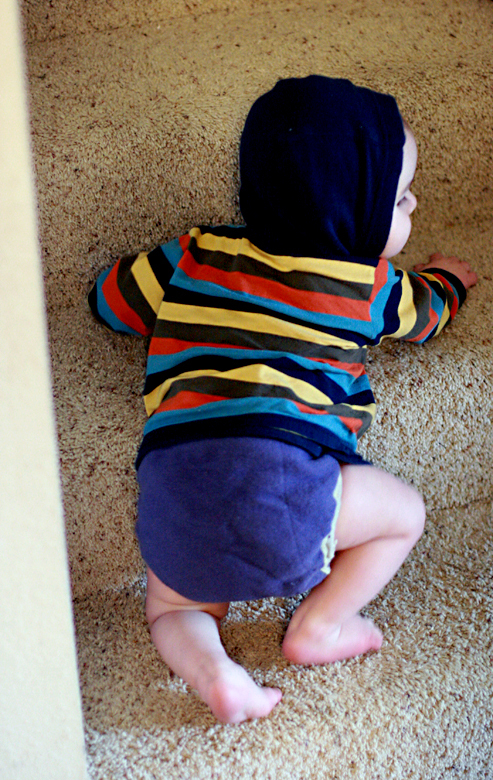 One mama’s gentle weaning story. A mom of five’s recollections of tandem and triandem breastfeeding through four pregnancies. Her description “they feel like they’re all teeth and scrapy cat’s tongues” made me laugh in relief, because that’s exactly what it feels like right now to nurse my 4-year-old. It’s nice to know someone else has felt what you’re feeling — and made it through. If I sank that low while wearing a baby, I'd still be on the floor today. 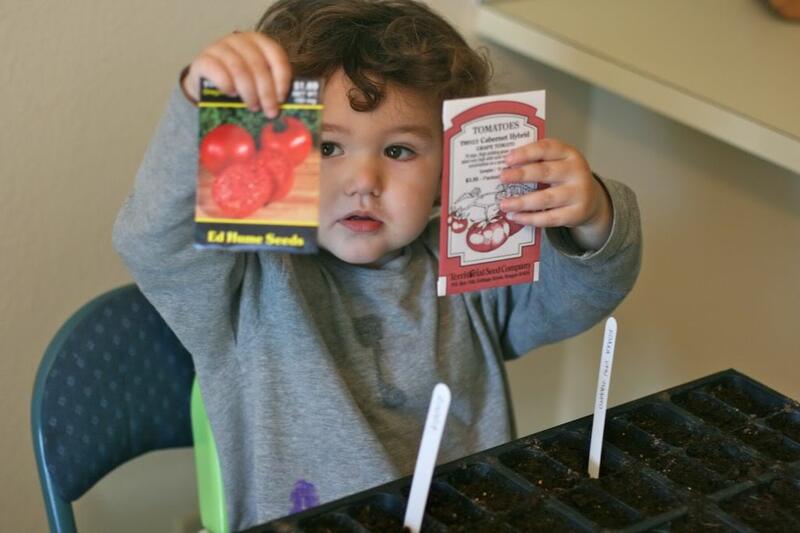 Pose with these seeds, kid. We'll be putting up our official call for submissions soon, but here's a head start. Tell us how your kids get clean, by April 3. Is parenting next to cleanliness? Tell us how your kids get clean — for instance, share a recipe for homemade shampoo, give tips on ending bathtime struggles, or offer a hairstyling tutorial. Submission deadline: April 3. Carnival posting: April 10. I'm happy to have a guest post on frugal ways to kickstart your garden at Anktangle. I love gardening, and I love that it's possible to garden frugally. If you've been curious about what kind of setup is necessary for starting plants indoors, here are some practical tips to get you and your family growing. It's the perfect time to start some seedlings for your summer garden (if you live in the northern hemisphere, at any rate). And you can do it successfully with little fuss and expense and not much in the way of special equipment and supplies. This is Part 2 of a new series on baby signing. My last video showed some examples of a baby and young toddler signing (as well as what the signs look like as signed by an adult). This short clip is of Mikko at two years old and gives some idea of how slightly older toddlers or preschoolers produce signs, and also how they might use sign language to enhance and clarify beginning speech. My many thanks go out to the inestimable Signing Time series for the Happy Birthday To You DVD, from whence come all these fabulous birthday party signs (also available on Amazon for sale, or rent!). At first I thought the birthday DVD would be too narrowly focused. I failed to take into account that kids love birthdays and will gladly talk about them all year round, and no matter whose party it is. I can't keep up anymore! Alrik can disappear out of sight in a flash. The audio is just background music, so you can watch it with the sound turned off and not miss anything! 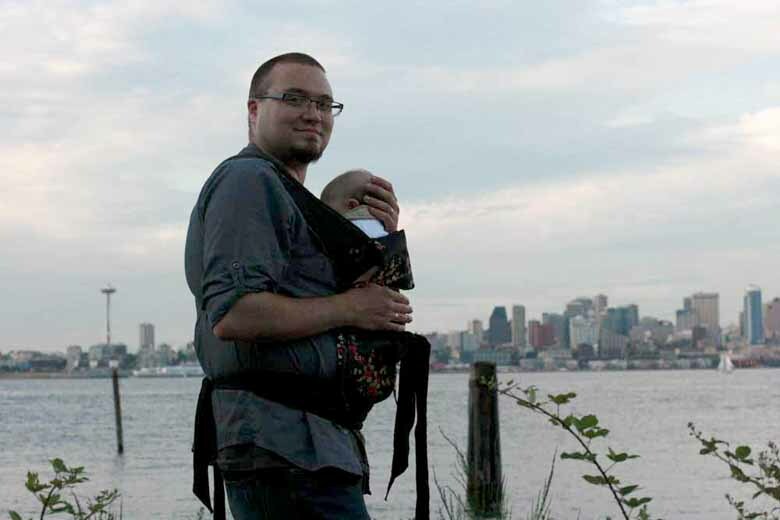 A mei tai is a versatile and comfortable carrier that works for newborns through toddlers, and for parents and caregivers of most any size to wear. It's highly supportive and can be worn on front or back. 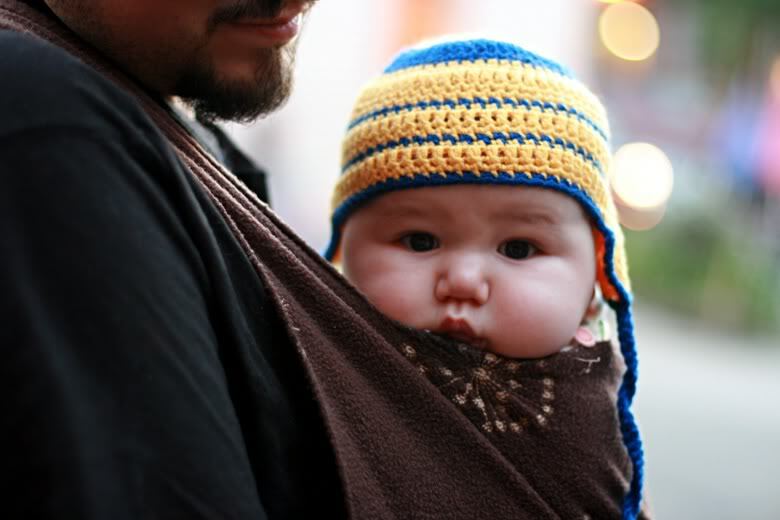 It's also easy to learn to tie on securely, making it a good choice for beginners to babywearing. 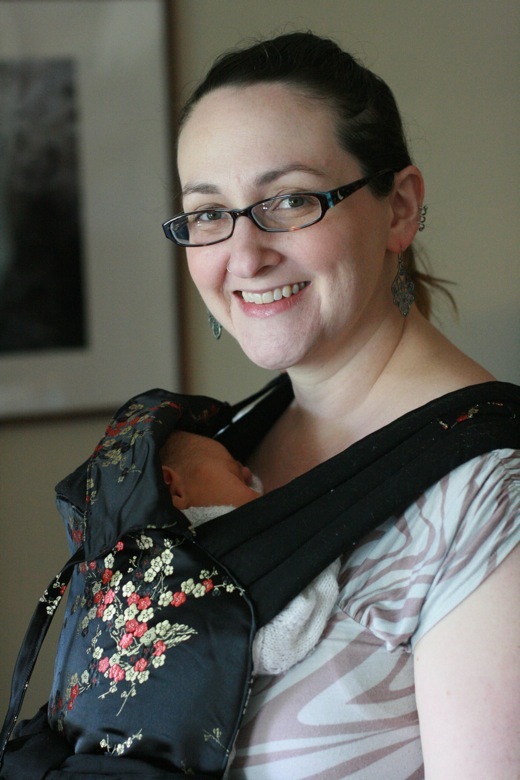 You can even breastfeed hands-free in a mei tai once you get the hang of it! 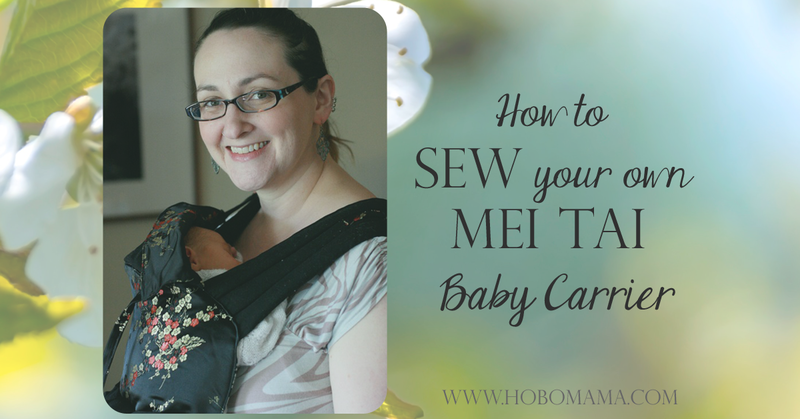 The advantages of sewing a mei tai yourself are that it's fun (!) and that you get to pick out exactly what fabrics and features you'd most enjoy. It's also a relatively easy project if you can sew at all, since the mei tai shape is primarily a rectangular panel with long shoulder and waist straps. Plus, there's all the gratification of being asked time and again, "What kind of carrier is that? It's beautiful!" and being able to answer in a tone of convincing modesty, "Oh, this old thing? I made it." The abbreviation in parentheses is how I will reference each tutorial in the following instructions. I found that the basic ideas for assembling the mei tai were the same, but they differed in details and particularly in measurements. This how-to is what worked best for me, but you can adjust for your own needs. 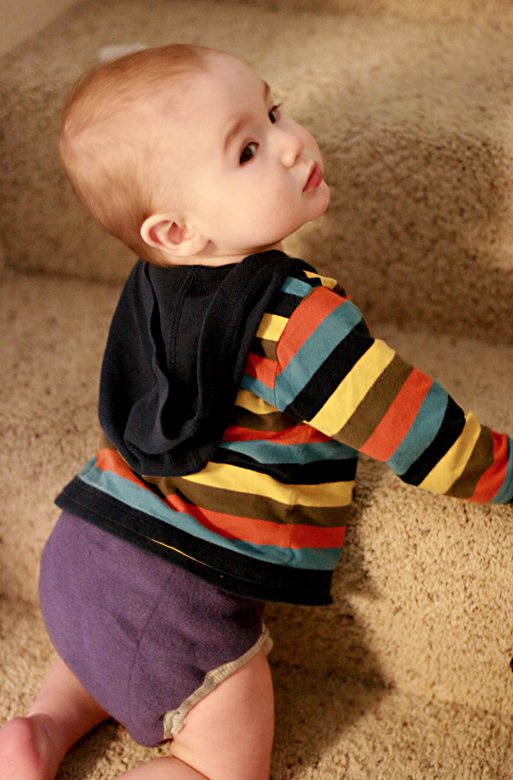 I made two versions: a larger toddler version in khaki that was heavily padded to work well for the colder months. I added the feature of interchangeable panels to that one, but I will tackle that in a future tutorial. I then made a smaller and less padded version in black that works well for the newborn days on up and all seasons. That's the mei tai I'll be referencing here in most of the instructions, though you'll see pictures from both versions. Bottomweight fabric. 54-60" wide. 2 to 2.25 yards is fine for most body sizes (choose the end of the range corresponding to your own relative size). The fabric store will have signs denoting which fabrics are bottomweight; it should also say so on the bolt. 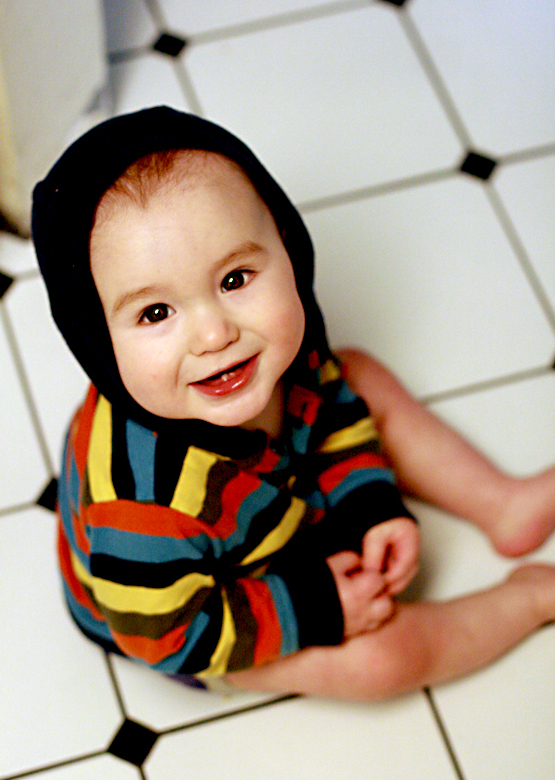 Don't skimp on the sturdiness of this fabric, since your baby's safety is dependent on a strong fabric. I used a heavy canvas. My black canvas is plain, and the khaki one had a bit of a pattern embossed. Decorative fabric. 1/2 to 5/8 yard. I went with a satiny brocade. Printed cottons would also be lovely. I always advise people to remember that you are wearing the carrier, not your baby, so pick fabrics and colors you like and that look good on you. Lining fabric. 1/2 to 5/8 yard. Flannel, fleece, and minky are good choices. This will be up against your baby, so snuggly is desirable. 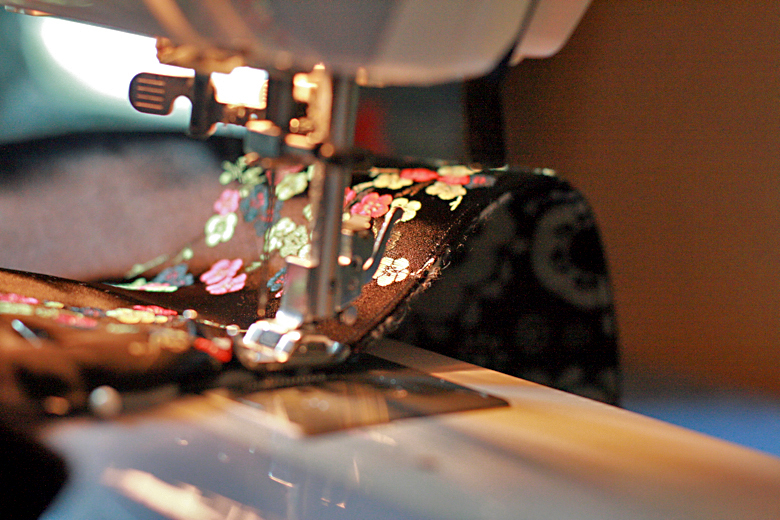 If you want a reversible mei tai, you can alternatively use two types of decorative fabrics. I combined these ideas and used a decorative snuggly fabric that I can face out for any occasions when I want variety. If you're sharing the mei tai with another caregiver who doesn't like your choice of decorative fabric, having a reversible design more to the other person's taste might be a good way to please both of you. For my black mei tai, I went with a black and white flannel design, and for my khaki version, I used leftovers of brown embroidered fleece from the no-sew mei tai we used the most for Mikko. That way, I knew Sam had one side that wasn't as shiny; as it turns out, he doesn't mind and wears the brocade showing anyway. It's been an eventful last two weeks, if by eventful I mean trying to recover from Grandma's visit, then (my kids') illness, then (Mikko's) tooth surgery, then (Mikko's) reaction to the antibiotics the dentist prescribed. Fortunately, everyone's well, but hoo boy. Mikko has the worst baby teeth. They started coming in at three months, which apparently is really bad, because they're weak and just keep falling apart. We've been trying to convince his molars to stay intact as long as possible to guide in the permanent teeth, but one finally had to be extracted. I don't really want to think about it that hard right now. But someday, it might be worth a blog post on when you have to help your kids through medical or other procedures that they need but that no one wants to go through. An example of what my note did NOT look like. 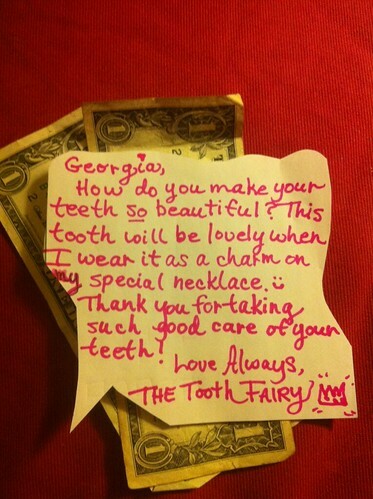 Once he finally got over the trauma, he did in fact enjoy his first tooth fairy payout. He knows we're the tooth fairy, but he loves the whole concept of waking up to find money under his pillow. Hey, who wouldn't? I went a little overboard out of guilt, so he bought a little stuffed panda with his haul that I think we should name Toothers, but that he just calls Panda. (He's an auteur when it comes to naming.) I also left a note from the Tooth Fairy that I hastily scrawled on scrap paper in the dark, for such is my ability to produce scrapbookable objects, and he loved it and had me read it to him several times throughout the day, which I thought was sweet. But then he got this fantastic rash from the amoxicillin being used to treat an infection in a different molar (the kid's been living on air and yogurt the past few weeks, poor thing). We had to keep him quarantined a few days just in case it was something more spectacular than hives, like chicken pox or rubella. As it turns out, despite being a homebody, I really hate being told I can't go anywhere. And Mikko wasn't sick in the least, so it all felt overdramatic. But his rash is fading, and despite it all, I was also able to read a bit. You'll notice that many of these come from other people's Sunday Surfs. I was thinking about including even more but started feeling a little silly. It's not my fault they picked good links. I was just thinking today — wait for it, it’s quite the revelation — This is my body for the rest of my life. Why not just be happy in it? Disney vs. other versions, a guest post from Shannon of Pineapples & Artichokes. When I played princess as a kid, I always focused on the before part of life, usually making up my own stories about things that happened in between or before the written versions. But much of ‘imaginative’ play for little girls nowadays is focused on non-active pursuits. Boys are encouraged to be race car drivers, pirates, firemen, military men. They get to save people and fight. Girls are encouraged to shop and be pretty. Both of those things are fine, but what are we teaching them when that’s all we expect? What are we teaching boys when they can’t do those things too? On how future-oriented language can sap our ambition to start a change today. I read Alfie Kohn's perspective on the detriments of praise and took it to heart, but — like many other parents — I found it hard to figure out what to say in its place. Is all praise harmful? Is there a better way to convey appreciation for our child's gifts or excitement in our child's accomplishments? If so, what is it? Amy swoops in with her trademark wisdom and gives us concrete ideas to offer forms of praise without judgment or manipulation. The CarNatPar is live, with a roster of inspiring and informational links. The Pregnancy Necessities Blog Carnival, hosted by Parenting God's Children, is also live — and tons of fun! 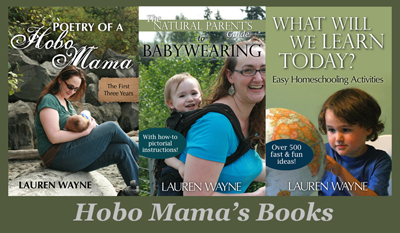 Find other carnivals at my Natural Parenting Carnival Linky. And please, please, please help me keep it updated by adding in carnivals OR memes (recipe linkups and the like) that you're hosting or entering! It would be soooo helpful. Don't be worried that yours is too small — I want to promote everybody's special blog parties! Even if the carnival or meme is already represented but you want to update the information, enter it again and I'll go in and delete the old info. Thank you! I'd love to make it a helpful resource for all of us. 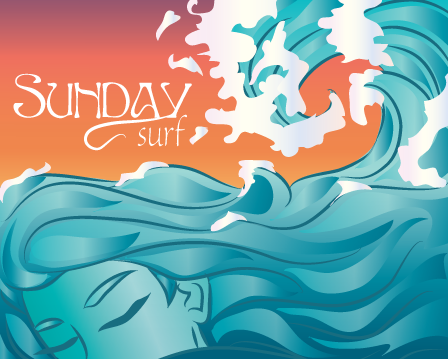 Sunday Surf: Celebrate saving daylight!